I am a life-long sports administrator; having worked in sports marketing and sponsorship for more than 20 years. The skills I have developed through that period are sometimes unique to sport and sometimes applicable across all aspects of life. About six years ago, I decided to deviate from my sports industry path and spend time working in a charity. My role was with was St Vincent de Paul; a large homeless charity in Australia where I took on the role of Director of Marketing and Fundraising. Up until that time, my entire career had been spent in sport and using sports marketing theory, philosophy, and practice to round out my sponsorship approach to selling, servicing, and reporting. It was only natural that, upon entering the charitable space, that I try and utilise my prior approach and mould it to fundraising. What fell out, to my surprise, was an approach to fundraising which was cast from an absolute mould of sponsorship and philanthropy. I realised that sponsorship professionals are amazing fundraisers! As a result, I created a four-step approach to fundraising which utilised the strengths of a sponsorship professional’s tool-kit, moved back into philanthropy for sport, and set my theory to task. As in sponsorship, it is vital to articulate a need. Often, within sponsorship, this may be better titled ‘Opportunity’. By Need, we are not talking about a dollar figure but instead are discussing a specific action which is required such as needing donations, financial support, or volunteers. The Cause is the emotive hook and it is closely linked to the Need or Opportunity. It is, however, more of a descriptive element of your story. Within sponsorship, this may be more commonly referred to as ‘Property’ or ‘Designation’. This is the most important part of the story. This is literally where you can place imagery in the mind of your counterpart and start to get them to believe that they are already involved. The Impact on fundraising is the change that their support or donation can help to achieve. To tighten the grip of the emotive element, you may even go as far as saying it isn’t achievable without their support. Within sponsorship, the Impact is the ROI and ROO elements and the alignment of this opportunity to their objectives which would be targeted. Funnily enough, this is the most forgotten, avoided, or missed part of the story-telling process in selling. What action is required from your counterpart as a result of this pitch, story, or campaign? It is vital to be 100% specific about this, be clear on what you want, and when you want it. You can tie the ask back to outcomes such as $100 will help buy a helmet for an underprivileged child. Why is storytelling perfect for sport? Sports administrators, professionals, and fans are a special and passionate breed. Sport is the perfect and proven vehicle for impacting social and health change within communities and the emotive stories are endless and ever-coming. Most people can resonate and imagine a time when they were personally involved with someone in the exact situation your story positions. As such, the emotional engagement triggers are already there to influence and engage their action. Sponsorship stories, statistics, and the evidentiary proof are all there to show how sponsorship is by far and away the best way to engage with audiences which are otherwise tough to reach. 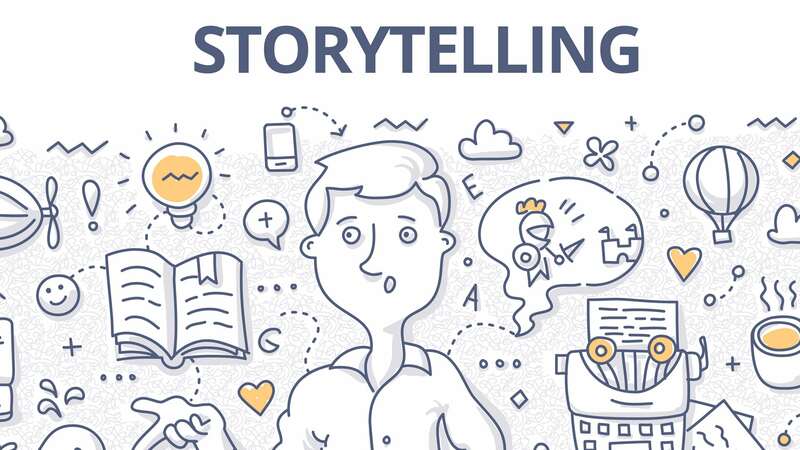 Storytelling is the way to get the emotional, visual, and fear-of-missing-out decision making juices flowing. Obviously the story itself is important, however, the most important part is the reporting and review process. Whether it be a sponsor or a donor, saying “Thank-you”, delivering on what you have promised, and then reporting the impact of the investment is proven to make up to a 75% difference on the likelihood of follow-on financial support. So, get your creative juices flowing, get emotional in your story-telling, and be sure to follow-up with a recap and you will be on your way to fundraising and sponsorship success!